Two brothers Alfie and Burt Lawson founded the Leigh Motor Boat Club in 1962. The “club” originally started out as a fishing club and at the time it was strictly men only, they used to meet at the Woodside Café on top of Belton way. From there the club moved to Alfie Lawsons workshop on Queens Avenue. Then onto the Esplanade pub Southend! One club night they spotted a Thames Barge advertised in exchange and mart for the princely sum of £1000, the members hadn’t got the money to buy the boat outright so they managed to get a loan from the bank for £200. The loan enabled them to purchase the clubs first boat “Trojan”. Trojan was equipped with two engines a “Kelvin J4” and a “Russell Cirrus”. The members hired a professional skipper to bring the boat down the Thames from Sherperton to Leigh-on-sea where she was piloted all the way down the Leigh creek. Unfortunately the Local Council wouldn’t let the club keep Trojan in the creek, they were concerned that the mooring might break and take down the bridge linking Two Tree Island to the mainland. 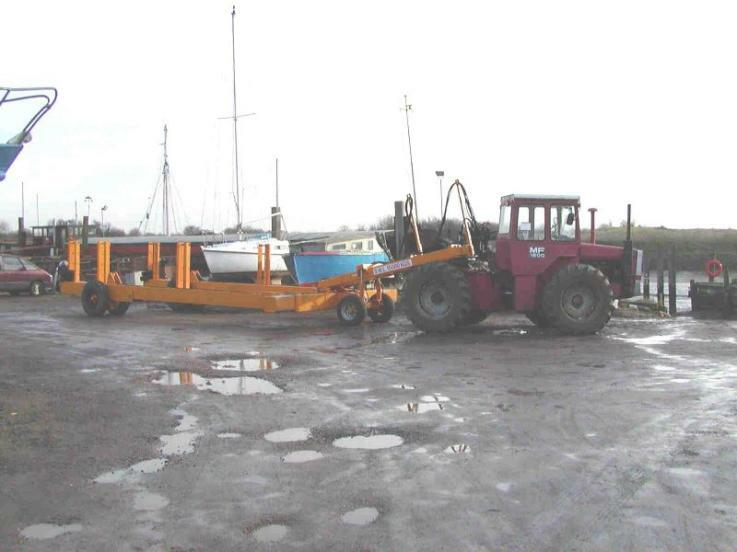 Instead the council offered a mooring in Old Leigh. However this arrangement also proved to be short lived as when the sea defences where strengthened in Old Leigh Trojan was forced into moving again. The council then offered LMBC a mooring back by the bridge where Trojan stayed for 13 years without breaking her moorings during this time she was turned into a Club House. After 13 years of glorious service, Trojan was eventually retired. The then Commodore, went over to Holland and sourced the current club barge “Lea”. LEA being the name of the previous owners second wife!. The new boat “Lea” was skilfully brought over from Holland by a certain Angus Watson, the passage took 11 hours from Ostend in Belgium to Leigh-on-sea, Essex. .
Once she was securely positioned in the creek Lea was then converted into the current LMBC club house.